I had 4 lessons with Steve Mitchell before taking my test. Steve is a very friendly guy that would move mountains for his learners, and he made me feel vert comfortable behind the wheel. If it wasn’t for Steves direction and teaching skills I wouldn’t have been able to pass. Highly recommended! Steve Mitchell was an excellent instructor. He made me feel really relaxed and was very patient. Thanks to Steve I passed first time after only 5 months. After 13 years of not taking any lessons I was very reluctant to think I would feel confident enough to start up again. However, I would strongly recommend Alan Paget if you want a very positive, relaxed and very informative reintroduction to taking driving lessons. Definitely feel safe and confident to get this done now! thank you very much, Alan. See you on Monday! Would definitely recommend my instructor Steve Mitchell who was really friendly and a great teacher, passed within 4 months with only 2 minors! I passed both my theory test and driving test within 6 months with Dan. I highly recommend Dan as he is a great instructor; he is patient, friendly & easy to get along with. Would like to say a massive thank you to Colin Vennall for being an excellent instructor! I passed both my theory and my practical first time, will definitely be recommending him!! I would highly recommend Robbies driving school and in particular my instructor Chris Hamney. An absolute brilliant teacher who has taught me a life long skill. Incredibly patient and flexible, would also recommend his motorway lessons for the newly qualified drivers! Thanks Chris!! Passed my practical test first time last week with Robbies. Steve Mitchell was my instructor and I would highly recommend him – so easy to get along with, patient and funny. Thanks again Steve :D! I would like to thank my driving instructor Colin Vennall for helping my manage to pass my test first time with only 3 minors. He is a patient, funny man who doesn’t slender raises his voice even when I did something wrong. I would recommend him to anyone willing to learn how to drive :). Passed my practical driving test today first time!! So pleased and a massive thank you to my instructor. Steve Mitchell, so patient. supportive and helpful! Going to miss driving the beautiful Audi though! Thank you again Steve! positive and friendly instructor. I enjoyed learning in the Mini – it was easy to get used to and nice to drive. Highly recommended. Thanks to Dan Cook for being a great teacher helping me to pass theory and practical 2nd round. Couldn’t of asked for a better instructor. I have passed both my theory and practical test first time thanks to Jenka Poole. She was so supportive, patient and friendly and I couldn’t have done it without her! Definitely recommend! Thank you so much! Just passed first time after also passing my theory first time with Steve Kellett. Highly recommended, thanks for putting up with me and helping me pass Steve! Passed both my theory and my practical test the first time round, thanks to the amazing Jenka Poole. Passed my practical today thanks to Dan Cook! Brilliant instructor, friendly, relaxed and easy to talk to would recommend to anyone, he was there when I failed my 1st test due to nerves and worked with me until I passed on my 2nd time. Thank you Dan! I just passed my test and Harry was my driving instructor. I previously had lessons with another driving school and switched schools because I felt like they were taking me through the process at too slow a pace and I had no control over what areas I needed to improve/build confidence. Once I started with Harry the situation completely changed. He allowed me to go at my own pace and build confidence. He’s easy to get along with and has a clear and genuine approach. He was also very flexible with picking me up/dropping me off at different locations and times. I have just today passed my driving test with Robbie’s! My instructor Keith Brown, was very good, he is professional and patient, two things that make the task of learning to drive just that little bit easier. I would definitely recommend Keith you will be sure to pass with him! Thanks Again Robbie’s and Keith! Passed first time today, would like to say thank you to my instructor Chris Mills, great teacher. He was always on time and gave great tuition, would defiantly recommend. Massive thank you to Chris hanney, for providing me with the knowledge and confidence to go on to pass my driving test first time with no minors at all. 😀 Brilliant, friendly guy. Recommend him to all. Big big Thank You to best instructor ever Bob Lapham!!!! Passed my exam first time just after a month driving 😀 Thank You for everything Bob, You are the best! Thank you to Steve Mitchell! Helped me Pass first time! Great instructor who is easy to get along with, patient and fun. Would highly reccommend! I learnt with Mark Beaumont in the mini, and passed with only 4 minors! Mark was brilliant, very calm and made lessons fun with his sense of humour. Thank you Mark! Highly recommend Jenka 🙂 both my children passed their driving tests 1st time! Always reliable and professional. My instructor was Mark Beaumont and I couldn’t have passed without him! He’s absolutely amazing and would recommend him to anyone! I passed within 3 months and I couldn’t have felt more comfortable in his car. The mini was so easy to learn in and was easy to understand how the car worked. I passed with only 3 minors and couldn’t have been happier with the support and guidance I got from Mark! Anyone who wants a relaxed instructor with a sense if humor to make you feel at ease then Mark’s the man to have! A big thankyou to Merlin for teaching me how to drive! Brilliant instructor and recommend him to anyone, thankyou! Thanks to Ken for helping me pass my test first time! i highly recommend him, fantastic instructor!!! I passed my driving test yesterday for the first time with only 2 minors! I couldn’t have done with without Merlin Courtenay, he was a great teacher, friend and I thoroughly enjoyed learning with him 🙂 Merlin gave me the confidence I needed to believe in myself. I would highly recommend him! I had Ken as a driving instructor. I started in January and passed on the 6th of March. He was a great teacher and made me feel confident of what i was capable of. Im really glad with the service I paid for. 😀 thanks guys. Passed my test first time on the 28th Feb with only 4 minors, all thanks to Les! I was an extremely nervous driver and very much hard work, however Les was amazing and made sure i was comfortable with the pace of the lessons. Very much recommend him for anyone who is nervous! Thank you Les!!! Passed my test this morning after being instructed by Chris for the last couple of months. I found him to be a patient and helpful instructor, as well as a thoroughly nice bloke! I was a more mature learner but can see that his demeanor would be excellent for teaching first time drivers. His diary was always packed but he went out of his way to fit extra time in when i needed it at the cost of his own (i’m sure very busy 😀 ) social life! Highly recommended. Passed first time this morning thanks to Chris Hanney! Great instructor and a really nice guy. He gave me loads of confidence while learning and would recommend him to anyone! Cheers Chris! Passed First time today! Driving instructor was Gerald Dardis; good instructor and a nice guy, helped me from the start until the day of the test! Thanks! Had a number of lessons with Simon – very professional and patient instructor, great sense of humour too 🙂 Simon has a nice new VW Polo – very easy to drive, almost impossible to stall. All in all, highly recommend Simon! Passed first time with Mark Beaumont yesterday :), great instructor and learning in the mini was a bonus! Would definately reccommend him to others. Thanks Mark! Just passed yesterday with Mark Beaumont. I had been learning with another instructor but I was going nowhere and somehow getting worse. Then a friend of mine mentioned Mark and I haven’t looked back since. Excellent teacher, adapts his style to your needs to ensure you get the best experience possible. Plus, the Mini was awesome to learn in! Pass first time! Gerald is a great instructor and a really nice guy. Passed my test with Steve Mitchell 😀 grate instructor!! Passed first time with Steve Mitchell 🙂 recommend to anyone very patient and great all around driving instructor. Having been told by another driving school that I would never be able to drive in a manual, car I gave up. Then a friend recommended Mark Beaumont & within only a couple months I passed 1st time…..in a manual!! Can’t thank him enough for his help & encouragement….fantastic instructor, ask for Mark!! I passed my test first time with 0 minors with no previous driving experience thanks to Ken Burrows. He’s a really nice guy and is incredibly patient as he lets you go over something over and over again until you feel confident with it. He’s also super reliable and friendly. I would highly recommend him! I passed my test Yesterday with Martin Bowell. He was really patient with me in all my our lessons and a great instructor. 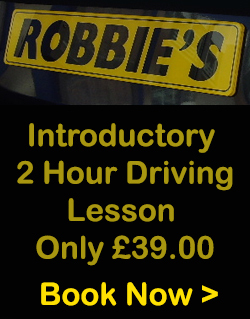 I would really recommend learning with Robbie’s Driving School(Martin Bowel). Thanks to Merlin who helped me past my driving test first time! Top instructor! Recommend all the waaaaaay! I passed my test today with Dan Cook. He was really patient with me in all my our lessons and a great instructor. I would really recommend learning with Robbie’s Driving School. I passed my first test last week with Mark Emery. Mark is patient, thoughtful and fun to learn with. He was great with me when starting out, but always pushed me when required as I was getting closer to test. I couldn’t have asked for a better instructor. Both my partner and I have had Jim Shortland as our instructor for the past few months and we are both taking our test soon.I started off as a very nervous driver with very little confidence, convinced as a slightly older learner driver (27) and having had lessons with other driving schools, that I would never be able to drive. Now here I am about to take my test!I knew after the first lesson that Jim would be the instructor to take me from learner to driver 😀 😀 He never got tired of my endless questions and going over things i was unsure of. I now feel confident when I get in the car.We would definitely recommend him to others, especially if you are a bit nervous! I had Ken Burrows as my driving instructor and I cannot fault the bloke! Everything I had to learn and carry out I was clearly instructed in the safest and easiest way! Felt confident every lesson! Top man, top instructor! Passed first time with only two minors and no previous driving experience, all down to the quality of Ken Burrows lessons! Highly recommend him! I passed my test 1st time with only 2 minors all thanks to Mark Beaumont. I’d had 2 previous instructors so it was clear to see how much better Mark was. Have already recommended him to friends, ask for Mark & you can’t go wrong!! To all aspiring drivers out there…Keith IS the driving instructor for you! Do you want to learn how to drive well? Keith is your man! Do you want to enjoy the process of learning to drive? Keith is your man! He makes what could be scary, daunting and painful, clear and easy. I am officially recommending him to you all. Massive shout out to Merlin of the Robbie’s crew! Really genuine bloke , top instructor and really easy to get on with! Recommend to anyone! Keith Brown is a great driving instructor, I would definitely recommend him. I was a very nervous driver to start with, but Keith’s patience and calm teaching allowed me to overcome this and pass my test first time. Keith was very good at explaining everything so that now I feel I have a good understanding and will be a safe, confident driver. Thank you! Keith Brown is friendly, very patient and calm. As I was very nervous to begin with, he made me feel relaxed and gave me the confidence to learn to drive. Keith always took the time to explain everything clearly to me and in a way that I could understand easily to be sure that I was knowledgeable and confident in what I was doing. He is very reassuring and supportive and I would recommend him to anyone! Thank you very much to Jackie Davis who is currently my driving instructor. She has helped me greatly boost my confidence with driving after being initially very nervous and is overall a brilliant and friendly teacher – Thank you! Keith Brown is an excellent driving instructor! very patient, knows his stuff and makes you feel confident to drive well. I had great fun on my lessons whilst learning to do everything I needed. I took my test and passed first time with no minors and this is definitely down to Keith’s instructing! I would highly recommend Keith to anyone who needs to learn to drive! would like to say a big thanks to Mark Beaumont he’s a top man and a great instructor passed the second time round with only 4 lessons and 5 minors, I’ll be sending people your way in the future! :) thanks again for all you wise wisdom! I have Simon as an instructor and he’s a brilliant instructor. Can’t believe how great he is I am learning so much so quickly. Thank you!!!! Keith Brown was my instructor. He was really good, and verypatient with me as it took me a while to get used to driving. I was quite a nervous driver and he accommodated this. Simon was a really helpful chap. exceptional teacher. gives you confidence, explains everything to reach high standards, simply the best. thanks again simon. Robbies lucky to have such a great instructor. should get a Christmas bonus. Mark is the Man – I started driving lessons with Mark when I was 18. I made the right choice. He is really down to earth, a right laugh to learn with. & his unique way of teaching made learning to drive both fun & easy…and I passed 1st time. Thanks Mark, you are a brilliant instructor. Now my younger brother has started learning with him – highly recommended. Having taken a 7 year break from learning to drive after my last instructor put me off (he told me I would never be able to drive), I started again with Mark Beaumont. He was an outstanding instructor who taught me with patience and instilled me with a huge amount of confidence. He was great to have a laugh with as well. I would recommend him to anyone. Jim Shortland is the best instructor around !!!! Colin Vennall was an absolutely brilliant instructor, great sense of humour, extremely flexible in his teaching methods, was calm, reassuring and honest in is judgement. Most importantly made lessons enjoyable, never a single lesson that I’d dread knowing Colin was my instructor! Would highly recommend! Thanks again! I was in luck with Robbies. I got Steve who’s an amazing instructor! He’s taught me so much in such little time and he also drives an amazing car! Overall an amazing instructor and I’m glad I have him! I was very lucky to get Stephen Mitchell as my driving instructor when starting out with Robbie’s, which certainly helped me gain confidence and learn at a good pace, as he is patient and articulate when explaining things. I would definitely recommend Stephen as an instructor to friends. I took my driving lessons with Jenka Poole and I couldn’t have picked a better instructor. She was patient and gave me the confidence to pass 1st time. Mark Beaumont has a lot of patience and helped me a lot with my nerves! Mark has a good sense of humour, is very reliable and has excellent teaching methods/ techniques (he even emailed me manoeuvre guides to help me remember)! I would highly recommend Mark, especially if you need an instructor with a lot of patience and excellent teaching methods. Mark Beaumont is a brilliant instructor, very friendly and very patient. Mark explains things very clearly. Thankyou Mark for you patience, especially with my nerves on test day…so glad I passed….freedom here I come! Mark Beaumont was an amazing instructor! I had started to learn with another Instructor but felt things were going no-where and started with Mark. He encouraged me to do my theory and i booked my test not long after starting with him. Changing instructors was the best thing i did and i cannot thank Mark enough for everything, especially helping me with my nerves! I would recommend him to anyone!!! Mark Beaumont is a brilliant instructor! Really helped build up my confidence in driving. Changing from a previous driving school to be introduced to Mark’s way of teaching was one of the best decisions I made. Every lesson was full of laughing, great sense of humour, but he has a bad choice of football team haha! Would recommend him to anyone, great methods, very patient. Steve Mitchell is an excellent, personable and extremely competent driving instructor. His positive, friendly and reassuring character made learning how to drive a fantastic experience and gave me the confidence to pass my exam on FIRST attempt. Thanks again Steve! Les Sleeper is an excellent instructor. He is very patient and has given me a lot of confidence. He is reliable and friendly; he has made sure that my practical and theoretical knowledge is the best it could be. Mark Beaumont is definitely the best driving instructor. He is always very patient, helpful, reliable and has excellent teaching methods. His Mini was great to learn in and handled very well. I passed my test today at the first attempt with only 2 minors and can safely say that I would not have been able to do it without him. I cannot recommend him highly enough. I would highly recommend Mark Beaumont and Robbie’s Driving School to anyone learning to drive and wanting to pass their test! Mark is a truly great driving instructor. Being very skilled, patient, friendly and confidence boosting he really made it so that I looked forward to my lessons each week. Jim shorthand is the best instructor around ! By far ! Mark Beaumont is an amazing instructor and very friendly! I couldn’t ask for a better instructor, he helped me with my nerves and was very patient! if I needed extra help he would email me driving guides. I also enjoyed driving the mini. I would definitely recommend mark to anyone and I passed with 3 minors thanks to Mark!! I was a very nervous driver, driving did not come naturally to me and Keith Brown was excellent. He was very patient and very knowledgeable. I would recommend Keith to anyone wanting to learn how to drive. Thank you again Keith. Never dreamed of passing my test first time. Thanks to Keith Brown for his friendliness and great lessons. Steve Mitchell: I passed my test first time with Steve’s help, Steve made driving very easy as he makes you feel relaxed and confident. I would highly recommend him!!!! Mark Beaumont is a legend of an instructor, he got rid of all the bad habits I’d picked up from my previous instructor, taught me my lefts and rights which was no mean fear, had endless patience and got me to pass with no minors. Can’t fault him. Mark Beaumont was an amazing driving instructor. He makes you feel comfortable and helps you by sending you personalised guides to explain things in more detail if you need it. He is calm and patient.. Not to mention hes an absolute legend!! I always had a laugh with Mark and the mini is a great car to learn in. I recommend Mark as an instructor and Robbies Driving School to anyone. Thank you Mark!!! Steve Mitchell is a very good driving instructor, his laid back approach has made it a lot easier for me to learn to drive. Great work Steve!! Steve Mitchell is a very very good instructor with lot of patience and passion towards his work.he is well organised and a very flexible and reliable person.i would strongly recommend him to anybody…. I did a fast track course earlier this year with Mark Beaumont and passed 1st time within just four weeks of turning 17. Mark was great and arranged everything around college lessons & have recommended him to all my mates. Jenka is patient while you’re still learning and knows how to help, Great instructor. Colin Vennall is a superb instructor, he makes driving easy! I would recommend him to anyone. Jim Shortland is the best instructor around !!!!!! A big thank you to Mark Beaumont for helping me get through my test. His patience and encouragement is amazing. I recommend him to everyone! My driving instructor is Steve Mitchell, good teacher, top guy. I learnt to drive with Jenka Poole 5 years ago. She was an amazing instructor. Always calm and encouraging and boosted my confidence enormously whilst learning to drive. Would definitely recommend her! I would highly recommend Mark Beaumont as a driving instructor. He is a very patient, encouraging and supportive teacher. I really enjoyed my driving lessons and with Marks fantastic teaching skills, I managed to pass 1st time after 10 lessons within 4 weeks. I passed my driving test with Jim Shortland, best driving instructor about!!!! Les Sleeper is an excellent instructor. He has given me a lot of confidence by his thorough and patient instruction. He is friendly and reliable and has ensured that I have a really strong practical and theoretical knowledge. Mark Beaumont is an excellent instructor who was patient and understanding. Throughout my lessons he gave me much encouragement and always made good conversation throughout my lessons. With Mark I passed first time. I would recommend him to anyone looking to learn to drive. Highly recommend Les as a driving instructor. He’s very good at helping you to feel relaxed and teaches you how to drive as opposed to just teaching how to pass the test. He has also been extremely helpful and flexible- fitting in lessons to meet my busy schedule. Thanks Les!!!! I was very nervous when first taking Lessons, I’d left it quite late in life to learn, but Colin was amazing, he taught me so well, not just how to pass a test, but how to drive afterwards. I feel really lucky that Colin is my Driving instructor and would recommend him to anyone who is looking to learn to drive. Being a nervous sort of person and learning to drive, Colin was the perfect person to have as my instructor. He is great at teaching anybody who is anxious about driving. I was so nervous about learning to drive, Colin was recommended to me, and he is incredible! He is so patient and reassuring, and I now look forward to my lessons! I cannot thank him enough for being such a fantastic instructor. Jenka is great, she is very detailed which allows me to fully understand all aspects of the road. I feel at ease when asking questions and she makes me feel comfortable enough to ask anything I’m unsure of. I highly recommend Colin Vennall to everyone looking for the best instructor to go with, he makes lessons enjoyable and i always look forward to my lessons with him. Thanks Colin see you soon! After having lessons 4 years ago with another company and taking 3 tests without success, i decided i would give it another go. After only two months and eight lessons with Mark Beaumont i had passed both my theory and my practical tests. Mark is an outstanding instructor, and is very friendly and easy to talk too. I would highly recommend Mark to any other learner drivers! I would recommend Mark Beaumont to anyone learning to drive. He is really easy to get along with, really helps to keep you composed and stays calm when when you make mistakes. When there was something you couldn’t quite get the hang of he was patient and encouraging and lessons would always be fun even when you’re having a bad day. When I heard I could give Jim some feedback I was more then happy , he is a talented knowledgable instructor with skills and a friendly attitude . I am definitely not the world’s most natural driver and have given Colin Vennel a few hair raising moments during the time he taught me, but his patience, sweet nature and sense of humour saw me through to a pass with three minors. Thanks a lot to Colin. I would recommend him to anyone. I passed my driving test with only 1 minor thanks to Mark Beaumont, he is a brilliant driving instructor and the Mini is amazing. I would highly recommend him to anyone learning to drive. Mark Beaumont is an incredible instructor and would recommend him to anyone! He’ll develop you as a driver and make you feel comfortable in driving as he done with me and i’m glad i had him as an instructor. I passed 1st time, and his Mini is the best car to learn in. Mark Beaumont is an amazing instructor, learning to drive in his Mini was great. He emailed lots of stuff across to help me progress away from driving lessons. Already recommended him to many friends, 10/10 for making you feel calm and keeping you laughing. Thank you very much. Steve Mitchell is brilliant. I’d gone through a number of instructors before settling with Steve. He pushes you out of you’re comfort zone to learn quickly and to boost your self confidence. Just started my lessons with Jim shortland &#128522; loves my first lesson he is brilliant ! This is due the my driving instructor Keith Brown who was friendly, formative and very professional (rating of 10).Thanks for everything and I would strongly recommend this driving school to anyone I know and I would recommend to ask for Keith Brown as your instructor. Thank you Keith Brown for giving me the confidence to drive.I took my test while ago, but felt at ease because of his patience, humour and great ability to help me understand all the elements of driving. After a lot of on and off driving, choosing Robbie’s Driving School and Keith as an instructor was the best decision I could have made. Highly recommended. I’d highly recommend Colin Vennall! Passed first time thanks to him when I never imagined I would. He’s a brilliant instructor! Nice, patient while I found things difficult and full of memorable sayings to help me remember what to do in particular situations(and memorable anecdotes). Lessons were enjoyable, and I looked forward to them rather than dreading them as I did with a previous instructor who I’m so glad I replaced with Colin. I would highly recommend Jackie Davies- She has great teaching methods with lots of tricks and methods to remember driving musts, is extremely patient and very considerate. I have learnt a lot from her in a very short space of time- thank you Jackie! Thank you Colin Vennall for showing me that learning to drive can be fun and not scary! You are the best! Hi there just wanted to post spittle message about my driving instructor Vajenka Poole!! She is lovely and with her patience and good driving skills made me pass my test first time! Her trust and faith placed with me when ever in one of her lessons is why I recommend her to anyone who is willing to learn! Vajenka is lovely and calm she only wants you to do your full best! Being an older driver I was very nervous about learning to drive for the first time. Jenka Poole made me feel at ease from the moment I sat in her car. In my opinion she is a fantastic instructor. I passed first time thanks to her. Her skill and commitment were first class. I was instructed by Les Sleeper and have passed my test. I would highly recomend Les as he is comfortable to drive with, Teaches everything in depth, has great communication in both organisation of lessons and during the lessons and mostly, A great Guy! Many Thanks! After restarting my lessons in bath I have been supported by les sleeper. His humour and patience leaves me more confident every week, building me up to that all important test date positively. Would definitely recommend him! I would recommend Steve Mitchell! His patience keeps me calm and he makes driving fun. Nice guy. I recommend Les Sleeper, he is a great instructor, very helpful, patient and very funny! Collin taught me how to drive (and pass) earlier this year. He was the best instructor I had by far, he was always calm- elevating any nerves, funny and always puts in extra for the good of the customer. Such a positive and enthusiastic person bursting with energy. Andy is an absolute pleasure to learn how to drive with. Calm, patient, funny and understanding. I never expected to pass so quickly and I would (and will) recommend him to everyone. I’ve been learning to drive with Jim Shortland, excellent knowledge and advice has given me confidence and experience when driving. I feel I have the confidence to take my driving test but will miss the expert tuition on the road. I am currently learning to drive with Jim. My experience has been brilliant.I was very nervous about learning to drive but Jim’s calming manner soon put me at ease. Jim has the patience of a saint and continues to believe in me despite my many mistakes. I would definitely recommend this instructor. Merlin is a great guy good instructor! Would highly recommend to anyone! A huge thanks to Jim Shortland , top bloke and great instructor , made driving easy with all of his hints and tips ! What can i say, just an absolute pleasure to have learned with Mark Beaumont! I passed first time, he ironed out every if not all bad habits i had (hands! ), walked me through every manoeuvre in a way that i could only get better, was always positive, even in the times i made a mistake, which encouraged me a lot! I would recommend him to any and everyone! Excellent!! Richard was a great instructor! 100% satisfied with the service that I had 🙂 Would Recommend this driving school! I strongly recommend Jenka as a driving instructor, she is very understanding and give’s great lessons!! Thankyou!! I would recommend Mark Beaumont, and have to many of my friends. He is really easy to get on with and he made me feel really comfortable and confident. Couldn’t have asked for a better instructor. I was able to pass my test first time with only a few minors. thank you Mark!! Steve Mitchell is a great instructor, he made me a confident and observant driver. Thanks, Steve. Passed first time with a lot of help from Steve Mitchell. Had a few driving instructors previously with other companies, but Steve was by far the best. He was always very patient and flexible. Would definitely recommend him to anyone!!! Thank you!!! Massive thank you to Steve Mitchell for helping me pass my test first time back in September! 😀 Best instructor I found and would recommend to anyone who wants to learn confidently and have some fun! Thank you ! Colin has been an amazing driving instructor to me. He gives an insight into proper driving and gives simple info so it is easy to understand. Thanks Colin! Colin has been an absolutely fantastic driving instructor to me as he is always smiling and making jokes. More importantly, he remained patient even when I made silly mistakes and happy to repeat instructions if I found something difficult. I passed first time not only because of the work I put in but also thanks to Colin’s hardworking personality and good ethos. Thanks Colin! I have been having lessons with collin vennall , I’m an extremely nervous driver and collin is both patient and re-assuring. He is an asset to robbies and an exceptional teacher :-). Mark Beaumont was complete fab, he made me confident and believe in myself. He was tough on me and when he needed to be and lessons were so much fun, constantly laughing and making me feel at ease from the first lesson. Cannot thank him enough for helping me pass first time. He is an absolute babe. Thank you!!!! Just passed my test at the 1st attempt thanks to Mark Beaumont. Great banter in lessons, fantastic Mini to learn in, & to help me Mark even booked my theory and driving test for me, fantastic instructor, definitely recommend!! After failing first time round with a different instructor I nearly gave up until Jim Shortland was recommended by a friend. Top man, top instructor. Thanks for getting me passed. Thanks so much to Merlin Courtenay for being such a great driving instructor. He was really friendly and made my lessons enjoyable. Recommend him to anyone. Thanks again! Jenka Poole is actually my replacement teacher after having a traumatic experience with my previous one. She is so professional, full of knowledge so easy to get on and very calm. highly recommended!!! Jenka Poole has been a great driving instructor for me, she has especially helped with building my confidence! A massive thank you to Merlin Courtnay! A fantastic instructor who I would recommend to anyone wanting to learn to drive. I recently passed with 3 minors first time. I really enjoyed my lessons and will miss them! Thank you again! I started driving last year with Richard Hornsby. Previously had another driving instructor but was nowhere near as good or as thorough as Richard. Would highly recommend him as he helped me pass my test first time…with only one minor!!! Thank you Richard. Started with Jim Shortland after a reccomendation with from my cousin he is a easy going nice man with great knowledge and excellent at his job ! Use Jim !!!! Not only is Jim Shortland a brilliant driving instructor he is also a top bloke!! He taught my brother and he passed first time!! Good work Jim!! Jim Shortland, such a calm instructor, made me feel very comfortable and calm… Helped me pass with only 3 minors! Highly recommended!! Definitely recommend Jim Shortland. Having a knowledgeable instructor who is also relaxed, stand up guy made me feel confident enough to pass the test. A massive thank you to jim Shortland , passed me first time ! Learnt with Mark Beaumont – he is a brilliant instructor! Passed first time and couldn’t recommend him enough! Lessons were great and I will miss them! Thanks Mark! Keith brown is a brilliant driving instructor!. I passed yesterday first time thanks to Keith, over the lessons he taught me not only basic driving skills but gave me confidence in my ability to be a great driver!! I would recommend Keith brown and Robbies to people Most definitely! :). Keith Brown has been the best driving instructor I could have wished for. He is so patient, friendly and knowledgeable! After having lessons years ago and not continuing, I had lost all confidence in my abilities but after learning with Keith I have built up tons of confidenceand passed my test 1st time! Thanks so much to Keith, lovely man and would recommend him to anyone wanting to learn. A massive thank you to dan i passed my driving test with only 2 minors i would highly recommend him to anyone in the future! Thanks to Dan cook!! Great instructor. Calm, Consistent, Patient and if he can help me to pass he can help anyone!! Learned with mark Beaumont-great bloke who’s easy to talk to! Learnt in a mini and was great to learn in! Passed 1st time, and only been driving since august, which I never thought would happen! I honestly can’t recommend him enough. Thanks mark! Thanks to Mark Beaumont, I passed my test first time today with just 3 Minors! Would definitely recommend him as an instructor! Very patient and relaxed! Even after having to tell me to take my ‘other’ left/right a few times 😆 Being able to say I passed my test in a mini is pretty awesome too! It was great to drive! Thanks again! A Very big Thank You to Dan Cook for giving me the confidence to pass my test first time!!!! A great teacher!! Keith Brown- A massive THANK YOU to Keith for making learning to drive so easy and enjoyable. I am 28 now so i started driving lessons later than most people do, but today I passed the test on my first go 😀 Keith is an excellent teacher, he explained everything perfectly and he was great at simplifying every daunting maneuver, he’s a very calm and patient person, he’s also great at encouraging you when needed. I would highly recommend Keith to anyone starting. My only regret is that I didn’t do it sooner. THANKS AGAIN KEITH!!!! Mark Beaumont – Mark was an amazing instructor! I had started to learn with another Instructor but felt things were going no-where and started with Mark. He encouraged me to do my theory and i booked my test not long after starting with him. Changing instructors was the best thing i did and i cannot thank Mark enough for everything, especially helping me with my nerves! I would recommend him to anyone!!! Mark Beaumont – Mark is an outstanding instructor! After only 9 lessons I passed first time thanks to his calm and easy teaching style coupled with his sense of humour! His mini is a fantastic car to learn in! Highly recommended! Go to Mark! Jason Bryan – Jason has been my one and only instructor and thanks to him I passed both my theory and practical first time! Towards the end I suffered with self doubt and Jason managed to put my mind at ease. He’s a great teacher and is a laugh, recommend him to anyone! Tim Carr – After failing my practical test a few years ago with a different instructor, I went back for a second go not long before my theory expired. Because of Tim, I managed to pass with two minors, two days before that could happen! I can’t recommend him enough# he’s a good laugh, a great instructor and probably the most relaxed guy I’ve ever met. Cheers Tim! Mark Beaumont – After having lessons 4 years ago with another company and taking three tests without success, i decided earlier this year i would give it another go. After only two months and eight lessons with Mark i had passed both my theory and my practical tests. Mark is an outstanding instructor, and is very friendly and easy to talk too. I would highly recommend Mark to any other learner drivers! Keith Brown. Top man! – I started driving lessons later in life than perhaps I should have, and it’s fair to say I was very nervous. Keith was excellent at putting me at ease and within a short time I found I was driving quite happily. Lessons were a joy. Today I passed the test on my first go. I highly recommend Robbies, and especially Keith as an instructor. Brilliant. My only regret? I didn’t do it sooner. ===Mark Beaumont – Mark was the best instructer you could ever ask for, his amazing mini was so easy to drive and his teacher skills and tecnique were out of this world.. id recommend mark 100; of the way. i passed first time in mt test !! and i feel amazing ! Robbies- Mark Beaumont – Mark was an amazing driving instructor. He makes you feel comfortable and helps you by sending you personalised guides to explain things in more detail if you need it. He is calm and patient.. Not to mention hes an absolute legend!! I always had a laugh with Mark and the mini is a great car to learn in. I recommend Mark as an instructor and Robbies Driving School to anyone. Thankyou Mark!!! Mark Beaumont – I learnt first over a year ago with another company who were awful and I gave up before taking any tests. After 26 hours with Mark I passed both my theory and practical tests first time! Mark’s very calm and easy to learn with, he eases the tension by making conversation and sends documents etc to help you remember things. Absolutely brilliant instructor!!! Robbies- Miles Bray – I had driving lessons with Miles- he is friendly, chatty, patient and put me at ease with my driving when I was nervous to begin with! I am really glad to have had him as my instructor as he has made the lessons enjoyable. I have managed to pass my test with 2 minors, so thank you! Mark Beaumont – Mark is such a brilliant instructor! Taking my driving test was probably one of the most nerve-racking things I’ve ever done but it certainly helped having a friendly and reliable instructor. Mark was always on time and able to work around my college and work times with no problem. He was really encouraging and helpful from start to finish – I passed first time and have Mark to thank for it! Mark Beaumont – Mark was a fantastic instructor. He was always encouraging and positive which made me feel comfortable and confident during my lessons. I passed first time having had 12 lessons. His mini is a brilliant car to learn in and I looked forward to my lessons and thoroughly enjoyed them all. I will definitely be recommending Mark and Robbie’s Driving School to people. Thank you very much Mark! Keith Brown – Keith Brown is very friendly,kind,calm,patient teacher.He is the best.I would recomended him to anyone.I’ve really enjoyed my lessons with him.Thank you very much. Chris is the best – i have failed few times with other driving schools but the robbies is the best and chris is the instructor you want if u want to learn in kingswood area !i wish i have learnt with him from start !passed my test not long after taking lessons with him! Jason Bryan – So much gratitude for this guy! After failing my test twice four years ago, Jason got me back up to test standard in 5 short weeks and i passed with just 1 minor! He’s a great teacher and anyone would be lucky to have him as their instructor. Highly recommend him and Robbie’s Driving School, they passed my brother and sister too! Chris Mills – I would highly recommend Chris Mills he is an amazing instructor, he’s patient, encouraging, and friendly, i wouldn’t ask for anyone else hes so nice and great to get along with, thanks to him i passed first time and had a lot of fun:) cheers for everything bud! John Lewis – I highly recommend John to anyone, he was brilliant. Had failed several tests before but John helped me to focus on the specific areas and i passed with only 5 minors. JOHN LEWIS – Thank you Mr.John Lewis. Excellent teacher,very supportive and a great person to learn driving. I PASSED WITH NO FAULTS. Meticulous in his job,encouraging,helpful I would say he is the best teacher. Usha. Mark Beaumont – Mark was brilliant and I would recommend him to anyone, he goes at the pace that you want but is always encouraging and positive. He helped me right from the start and was very friendly and also very professional, making sure that I got the best out of the lessons, once again many thanks Mark! Steve Sollars! 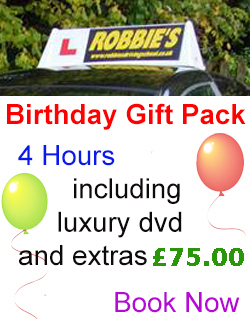 – Thankyou very much to Robbies Driving School and particularly Steve Sollars! Passed today and couldnt be happier. Was very apprehensive at first but Robbies made it easy to start learning and my instructor Steve made me feel comfortable, was always happy, friendly, patient and encouraging. Would highly recommend Robbies and Steve Sollars to any learners! Robbies – Mark Emery – Mark made you feel comfortable and was very efficient in the way he taught. If you did something wrong he w ouldn’t get frustrated he would just tell you what to improve on. Learning with Mark was worth every penny I spent on lessons, I would highl y recommend Mark and Robbies Driving School to anyone who wishes to learn. It didnt even feel like i was learning as i was laughing the whole time. Colin Vennall – Colin Vennall is a great driving instructor – I was anxious about learning to drive but he made the lessons fun and interesting and I always looked forward to my next lesson. I would definitely recommend him to anyone looking to start driving or that wants to change instructors as I passed my test with only 3 minors! Keith Brown – I would highly recommend Keith Brown to anyone who is wanting to learn to drive. He is very patient and encouraging and builds up your confidence behind the wheel as I was convinced I would never be able to drive. I passed first time with Keith with no minors! He made lessons fun and I always had a laugh. Thanks Miles! – I would highly recommend Miles as a driving instructor – he’s very friendly, patient and is always happy to explain anything you’re having trouble with. I’ve really enjoyed my lessons with him, and as a credit to his teaching, I passed my test with just two minors! A great driving school! Robbies – Richard – I had Richard as my instructor and was so pleased with his lessons and help. I was learning to drive when I was seventeen and after uni (and two failed tests!) decided to try a new driving school. I couldn’t believe how much my driving improved after just a few lessons with Richard and was ecstatic when I passed my test last week! So yeah Robbies is a great choice, as is Richard! 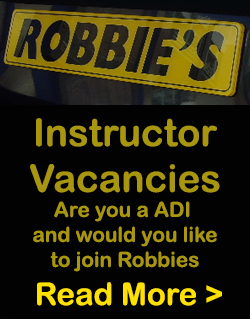 Robbie’s – Mark Emery – I would highly recommend Mark Emery as an instructor. His enthusiasm, patience and excellent teaching skills have led me to pass the practical driving test with only 4 minors. Mark put a great deal of effort into making sure I was confident in passing the test. His encouragement and experience have led me to become a self-assured driver. I was really lucky to have Mark as my instructor! Mark Emery – I enjoyed learning to drive with Mark.He’s a really good teacher whose friendly,funny and patient.Every lesson i would come away with something new.i had taken lessons 15 years ago and failed my test but with Mark’s help i passed the first time.So thank you very much. Miles Bray – I would really recommend Miles as a driving instructor he turned up promptly for every lesson and made them enjoyable, I learnt alot and have just passed my driving test with two minors for the first time!!!! Thanks Mark Emery – Mark was an excellent teacher, he kept me motivated and always encouraged me to be more confident. I would recommend Mark to a friend as he was friendly and we had lots of laughs. Mark Beaumont – If you are looking for a good and reliable driving instructor in Bristol then Mark Beaumont is the person you need to go to! Mark helped me pass my driving test within 4 months and this was due to both his friendly and informative teaching style. As an instructor he isn’t afraid to challenge you to make sure you get the most out of your lessons. Excellent – Steve was a great instructor i would definitely recommend him if anyone wanted to learn with Robbies. My only criticism is that he is a Sunderland fan but not everyone’s perfect. Thanks John Lewis! – Passed first time with only 2 minors# thanks to John Lewis! I would say that I was a fairly nervous driver when I started my lessons with John but he was so patient and reassuring that I quickly found myself becoming more confident. Excellent teacher and a very lovely man! Would highly recommend having lessons with John Lewis. Mark Beaumont – I Passed 1st time with Marks help. He is a fantastic instructor who was patient with me from the start. He took me from never having driven a car to passing my test within just 12 lessons!! He sent me personalised guides to help me learn, & even booked my test for me. Our lessons were always fun & I have already recommended him & Robbies to my friends. MARK BEAUMONT – I passed first time with 5 minors thanx to MARK BEAUMONT!!!!! So easy to talk to, didnt feel on edge atall. He made me believe that i CAN actually drive! He’s mint! Mark Emery – I would just like to say thanks to Mark for teaching me how to drive. His words of encouragement, patience and constant enthusiasm made learning to drive a real pleasure. I passed first time and that’s a testament to Mark’s aptitude as an instructor. I highly recommend Mark and Robbie’s driving school. Sound experience all round. Best Instructor in Bristol!!!! – Thank You Chris (Mills). You are the best!!! I would definitely recommend Chris Mills to any of those prospective drivers out there. He is very patient and helpful, giving clear instructions and boosting your confidence to become a better driver. Thanks to Chris I passed on 04/04/2012 on my first attempt, after just 17 lessons. Thank You so much Chris Mills!!!!!!!!!!!!!!!!!!!!!!!!!!!!!!!! Mark Emery – I really enjoyed all of my driving lessons thanks to Mark because he was so patient, funny and easy to get a long with! I would recommend him to anyone as he’s a great instructor and i passed first time with only 3 minors, so that definitely shows that he’s a great! Thanks Mark for helping me pass, I will miss our weekly Banter! Mark Emery – Mark is a brilliant instructor and i would recommend him to anybody he is very paitent and friendly i felt very relaxed with him and thanks to Mark i passed 1st time Thank you Mark will miss my lessons with you. Highly recommend Paul Johnson – Paul is a great instuctor – he is endlessly patient, calm, honest and helpful. Thanks to him, I passed first time. I will be recommending him to everyone, thanks Paul! Thanks Robbie – I passed my test first try thanks to Robbie, he was always encouraging and good at explaining things. He was really good both when I was nervous and in pushing me so i was ready for my test on time. I would really recommend him. Mark Emery – Many thanks to Mark for teaching me to drive, he is a friendly, funny chatty man who made me feel at ease, he made it easy to to ask any questions, however silly or small they were. May have taken me 3 times to pass but that wasn’t Marks fault, it was me making silly mistakes, he encouraged me to carry on till I passed!! Thanks again Mark. Mark Beaumont – I could not have asked for a better instructor. Mark was great from my first lesson with him. He helped me with my theory learning, booked both my theory & practical tests for me, emailed me gstep-by-step personalised guides on the manouvers, & I passed my practical test first time with just 4 minors. I have already recommended Mark to my friends & will continue to do so. Mark Beaumont – FAB!!! – Fantastic experience with Robbies thanks to having Mark as an instructor. I passed with only 2 minors! Enjoyed all my lessons & contiually learned lots during every lesson. Mark was fantastic at increasing my confidence & making me realise that driving was, actually, something I COULD do. Mark could not have been more helpful – sending me manoever e-mails & talking me patiently through it! Mark Beaumont – I found Mark an excellent instructor, he teaches driving in an informative and easy to understand way. I would recommend Mark to others. Paul Johnson: Outstanding!! – You will not find a better instructor than Paul Johnson!! I managed to pass very quickly with only 3 minors despite having zero natural talent. Paul is very enthusiastic, knowledgeable and has a great method of teaching which will get you test-ready very quickly. I can’t recommend him highly enough. Thanks Paul. Paul Johnson : fantastic – I started driving lessons at age 30 and was quite nervous about doing them. Paul Johnson was a fantastic instructor who immediately put me at ease and gave me lots of confidence. He was always encouraging and progressed the lessons at the ideal pace – I never felt rushed but neither felt we were going too slowly. Paul was great at accommodating lesson after work. I passed the test first time. Mark Beaumont – Amazing! – Mark is amazing, has unlimited patience, & always explained things clearly. Marks explained things in a way i could understand. I Couldn’t of passed without him. Marks really reliable, & always gets back to you if you leave him a message & always on time & friendly & has a really good sense of humour! Would recommend mark to everyone. I cant thank you enough. Thankyou so so much. Richard Evans A-mazing – Couldn’t have been more scared before my first lesson with Robbies, but Richard was calming and supportive and built my confidence up right until my test. Although I didn’t pass the first time, he helped get back on the road and to feel confident and comfortable with driving again to get a pass the second time round. Amazing and wouldn’t have wanted another instructor! Thank you Richard! Paul Johnson – I went to Robbies with a plan of taking my lessons and test within three months,i was put in contact with Paul who worked out a schedule that we both agreed to,working around my long hours at work.Paul is a professional, friendly,likeable chap who puts you at ease straight away and i passed my test first time two months later.Thanks again Paul for your excellent tuition. Eddie Briggs – Eddie is an excellent driving instructor who helped me to overcome my fears in driving and gave me the confidence to succeed my test. He has been very patient with me throughout my lessons and I am really grateful for him. Thanks Eddie, you are awesome and you deserve a plaque from Robbies. Keith Brown!! – Keith is an excellent driving instructor, he helped me to gain confidence in my driving ability and despite my nerves I passed my test first time!! Keith makes you feel at ease whilst driving with him and is patient and understanding. Thanks a lot Keith!! Mark Beaumont – Mark has to be the best driving instructor out there! He has a lot of patience and helped me a lot with my nerves! Mark has a good sense of humour, is very reliable and has excellent teaching methods/ techniques (he even emailed me manoeuvre guides to help me remember)! I would highly recommend Mark, especially if you need an instructor with a lot of patience and excellent teaching methods. Keith Brown, Just Brilliant – Just passed my driving test after two previous fails and several years not driving, this is largely down to Keith. He put me at ease immediately and taught me the ‘correct’ way to do things in an easily understood way. I can’t express just how impressed I was by Keith and will be recommending him to all of my friends. Any future learner would be lucky to be taught by him. Mark Beaumont – well first of all Mark is a fantastic teacher , i had doubts on myself passing my test but he kept me confident and always gave me advice on what to be doing and how to improve. i would recommend Mark to anyone that wants to learn to drive as he does his job so well ! But overall i have had a great time learning with Mark on how to drive, so a massive thanks to him for helping me pass! Mark Beaumont – Mark is an amazing instructor and very friendly! I couldn’t ask for a better instructor, he helped me with my nerves and was very patient! if I needed extra help he would email me driving guides. I also enjoyed driving the mini. I would definitely recommend mark to anyone. today I passed with 3 minors thanks to mark!! Mark Beaumont – Brilliant – I would highly recommend Mark Beaumont and Robbie’s Driving School to anyone learning to drive and wanting to pass their test! Mark is a truly great driving instructor. Being very skilled, patient, friendly and confidence boosting he really made it so that I looked forward to my lessons each week. Also, driving, and passing my test, in the mini was a dream! Thanks Mark! Keith Brown- Thank You – Thank you Keith Brown for giving me the confidence to drive. I took my test while it was snowing, but felt at ease because of his patience, humour and great ability to help me understand all the elements of driving. After a lot of on and off driving, choosing Robbie’s Driving School and Keith as an instructor was the best decision I could have made. Highly recommended. Mark Emery – I passed my driving test today so thank you very much Mark for being so patient and explaining everything so clearly. I will recommend you to everyone i know who needs driving lessons as i am in no doubt they would find you as easy to get along with as i have done. Robbie’s may have loads of instructors but MARK EMERY is the BEST!! I’m actually going to miss my driving lesson each week now!. Robbie’s MR Richard – HI,just want to thank MR Richard million times for his enormous help and precious advice, i passed my driving test yesterday and i am thrilled to bits,i would definitely recommend any body who his looking for a good and dedicated instructor to go for MR Richard at Robbie’s, i would rate him a well deserved 10/10.